Scientists have previously described an overgrowth syndrome in Saudi patients and named it ‘Upper limb muscle overgrowth with hypoplasia of the index finger’ syndrome. We describe a new case and document that the syndrome is caused by the somatic PIK3CA mutation c.3140A>G, p.His1047Arg. We also recruited one of the previously reported cases and found the same somatic mutation in the affected muscles. A wider classification of ‘PIK3CA-related pathology spectrum’ is presented which includes cancer, benign skin lesions/tumors, Cowden syndrome, isolated vascular malformations and various overgrowth syndromes. The latter entity is sub-divided into 3 sub-groups: overgrowth with brain involvement, overgrowth with multiple lipomatosis, and overgrowth without brain involvement/multiple lipomatosis. Our literature review indicated that “upper limb muscle overgrowth with hypoplasia of the index finger” is not as rare as previously thought to be. This overgrowth syndrome is unique and is caused by the somatic PIK3CA mutation c.3140A>G. The term “PIK3CA – related overgrowth spectrum” (PROS) has gained popularity in recent literature to describe a group of overgrowth syndromes/disorders caused by somatic PIK3CA mutations . In 2014, Al-Qattan described a new overgrowth syndrome in three unrelated Saudi patients and named it “upper limb muscle overgrowth in a proximo-distal gradient with hypoplasia of the index finger” (upper limb MO-hypoplasia IF). As the name implies, the two characteristic clinical features of the syndrome are:muscle overgrowth of one or both upper limbs which is manifested in a proximal-to-distal gradient, and congenital hypoplasia of the index finger. Other features of the syndrome are: flexion contractures of the fingers, hyper-extension deformity of the metacarpophalangeal joint of the thumb, ulnar deviation of the index finger, and a wide palm with abnormal palmar creases. In all previously reported cases, MRI confirmed that the limb overgrowth is due to enlarged/aberrant muscles with no fatty infiltration or vascular malformations. The most characteristic plain X-ray feature was widening of the space between the second and third metacarpals. No genetic analysis was done in Al-Qattan report . In this paper, we describe a new case of upper limb MO-hypoplasia IF syndrome and document that it is caused by the somatic PIK3CA mutation c.3140A>G, p. His1047Arg. We also recruited one of the patients reported by Al-Qattan ; and confirmed the presence of the same mutation. A review of the literature was also done for similar cases. Finally, we offer a wider classification of “PIK3CA – related pathology spectrum”. A two –month old male infant presented to the surgical clinic with overgrowth of the right upper limb. He was born vaginally at term following a normal pregnancy. The birth weight and length were at the 50th centile. Family history was unremarkable. On physical examination there was overgrowth of the right upper limb which manifested in a proximo-distal gradient (Fig. 1a). The index finger was hypoplastic and ulnarly deviated (Fig. 1b). The palm was wide with abnormal palmar creases (Fig. 1b). There was also hyper-extension deformity of the metacarpophalangeal joint of the thumb (Fig. 1b). No other abnormalities were noted on clinical examination. Plain X-ray of the arm/ forearm showed no abnormalities. X-ray of the hand confirmed the hypoplasia of the index finger and widening of the space between the second and the third metacarpals (Fig. 1c). MRI confirmed that the overgrowth was due to enlarged muscles with no fatty infiltration or vascular malformations (Fig. 1d). A muscle biopsy was taken from the volar forearm muscles. During surgery, the subcutaneous fat was noted to be normal and the muscles appeared hypertrophied with no other abnormalities (Fig. 1e). We recruited case #2 reported by Al-Qattan in 2014 . The 11-year old boy had muscle overgrowth of both upper limbs, but the involvement of the right upper limb was much more pronounced than the left (Fig. 2). The patient had all the classic clinical andradiological features of the upper limb MO – hypoplasia IF syndrome and showed no other abnormalities. A muscle biopsy was taken from the right forearm muscles and surgical findings were similar to our first case. Patients were assessed during their visit to the Plastic Surgery clinic. Detailed clinical data and radiological findings were obtained according to the Saudi Ministry of Health (MOH) guidelines. Protocols for peripheral blood sample collection, muscles biopsies, and genomic analysis were approved by the Research Committee at the National Hospital of Riyadh, Saudi Arabia in compliance withthe Declaration of HelsinkiPrinciples. Peripheral blood and muscle biopsy samples were obtained after signing a written informed consent form from all patients. Genomic DNA was extracted from the collected peripheral blood samples and muscle biopsies using Qiagen DNeasykit (Qiagen, Germany) according to the manufacturer’s instructions. The region, exons and the intron/exons junctions of the PIK3CA gene were amplified by PCR and bidirectional sequences were performed using previously described primers byBachman et al. using an ABI prism Big Dye Terminator v. 3.1 cycle sequencing kit (Applied Biosystems, Foster City, USA) and an ABI 3130 Genetic Analyzer sequencer (Applied Biosystems, Foster City, USA). Mutationswere identified by comparison to reference sequences (GenBank Accession No NM_006218.3; http://www.ncbi.nlm.nih.gov) using CLC Genomics Workbench v 8.0 (CLC bio, Aarhus, Denmark) and these were checked against theupdatedSingle Nucleotide PolymorphismsDatabase (dSNPs; http://www.ncbi.nih.gov) and the Catalogue Of Somatic Mutation In Cancer (COSMIC, https://cancer.sanger.ac.uk). Furthermore, analysis of the mutation was evaluated using different bioinformatics tools including ‘Mutation Taster’ (http://www.mutationtaster.org) to predict confirmation of “disease causing” mutation. Clinically, both of our patients had all the characteristic features of theupper limb MO-hypoplasia IF syndrome.Histologically, muscle biopsies from both patientsshowed hypertrophic muscle fibers with no fatty infiltration or vascular malformations.Molecular genetic analysis of both patients showed a similar somatic mutation within PIK3CA gene at exon20 (c.3140A>G, p. His1047Arg) in the genomic DNA obtained from the muscle biopsies (Fig. 3), but not from blood leucocytes. The upper limb MO-hypoplasia IF syndrome is not as rare as previously thought. Upon reviewing the English literature prior to Al-Qattan  report, several similar cases were found in the Hand Surgery literature [4–9]. These hand surgeons commented on the muscle hypertrophy of the upper limbs as well as the aberrant muscles and the deviation of the fingers. However, when we examined the illustrations of these reports, we also found that hypoplasia of the index finger was a constant feature. We also found two similar cases reported in the Genetics literature. Castiglioni et al. reported on a 6-year old girl with unilateral isolated upper limb muscle overgrowth. The authors only commented on the ulnar drift of the index finger; although the illustrations also showed hypoplasia of the index finger. An open biopsy of the interosseous muscle was done and revealed the same somatic mutation in PIK3CA (p.3140A>G, p. His1047Arg). Rasmussen et al. reported on a 20-year old female with bilateral upper limb muscle hypertrophy and concurrent upper back lipoma. The authors only commented on the overlapping of the index fingers over the middle fingers; although the illustrations also showed hypoplasia of both index fingers. A muscle biopsy also revealed the same somatic mutation in PIK3CA. Our review clearly confirms that the “upper limb MO-hypoplasia IF” syndrome is a unique entity that should be added to the PROS. The fact that all cases that underwent genetic analysis showed the exact same somatic mutation in PIK3CA is interesting. 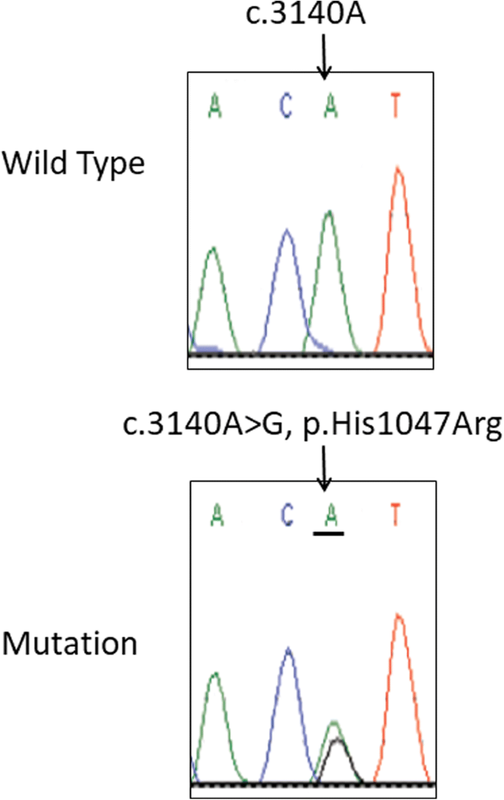 However, this does not mean that a genotype-phenotype correlation exists; since 70% of patients with PROS have one of three somatic mutations in PIK3CA: p. Glu542Lys, p. Glu545Lys, and p. His1047Arg . These three hotspot mutations also make about 70% of PIK3CA somatic mutations associated with cancer . We believe that a wider classification of “PIK3CA-related pathology spectrum” (PRPS) should be offered (Table 1) and should include somatic and germline mutations. This pathology spectrum should include cancer, benign skin lesions/ tumors, Cowden syndrome, isolated vascular malformations as well as the PROS [1, 12–25].The PROS should also be extended to include the “upper limb MO-hypoplasia IF” as well as the Klipple-Trenaunay syndrome as described by Yeung et al. . We also recommend dividing the PROS into three sub-groups: PROS with brain involvement, PROS with multiple lipomatosis, and PROS without brain involvement / multiple lipomatosis. Our PRPS is summarized (Table 1). Note that our classification is based on pathological entities (which is more clinically oriented) and not based on genotype-phenotype correlations proposed in Mirzaaet al. .
Isolated lymphatic, venous and lymphatico-venous malformation are associated with PIK3CA somatic mutations. The PIK3CA gene encodes the p110 α catalytic sub-unit of PI3K (phosphatidylinositol 3-kinase). All somatic and germline mutations of the PRPS are activating (gain-of-function) mutations of the PI3K pathway leading to enhanced cellular proliferation. The PI3K pathway (Fig. 4) is initiated by growth factor/cytokine stimulation of a receptor tyrosine kinase in the plasma membrane . This activates PI3K (which is heterodimer composed of a regulatory sub- unit known as p85α and a catalytic sub-unit known as p110α). The activated PI3K will then add a phosphate group to PIP2 to become PIP3 (phosphatidyl inositol bis-phosphate to phosphatidyl inositol tris-phosphate) at the plasma membrane lipids. The PIP3 will then recruit Akt1 (protein kinase B) to the plasma membrane, allowing PDK1 (phosphoinositide- dependent kinase 1) to phosphorylate and activate Akt1 at its activation loop site (Thr 308). Further activation of Akt1 requires its phosphorylation at another site (Ser 473) by mTORC2 (mechanistic Target of Rapamycin Complex-2). The fully activated Akt1 will then induce several cellular processes including stimulation of cell proliferation and suppression of apoptosis. The PI3K pathway is negatively regulated by PTEN (Phosphate and tensin homolog) and this is done by converting PIP3 into PIP2. Hence gain-of-function of PIK3CA, AKT1, and MTOR; or loss-of-function of PTEN will result in cancer, benign tumors, and overgrowth syndromes. For example, proteus syndrome (sporadic, mosaic, asymmetric and progressive overgrowth of body parts with cerebriform connective tissue nevi being characteristic of the syndrome) may be caused by gain-of-function somatic mutations of AKT-1 , or loss-of-function germline mutations of PTEN .Similarly, Cowden and Cowden-like syndromes are caused by loss-of-function germline PTEN mutations as well as gain-of-function germline mutations of PIK3CA and AKT1 . Finally, megalencephalysyndromes maybe caused by gain-of-function somatic mutations of PIK3CA (Table 1) or gain-of-function germline mutations of MTOR . The PI3K pathway. The RTK (receptor tyrosine kinase) is stimulated by growth factors and cytokines. This will activate the PI3K. The activated PI3K will convert PIP2 to PIP3 at the cell membrane. The PIP3 will recruit Akt1 (protein kinase B) to the plasma membrane; allowing PDK1 to activate Akt1 at Thr 308. Further activation of Akt1 at Ser 473 is done by m-TCRC2 (mechanistic Target of Rapamycin Complex – 2). 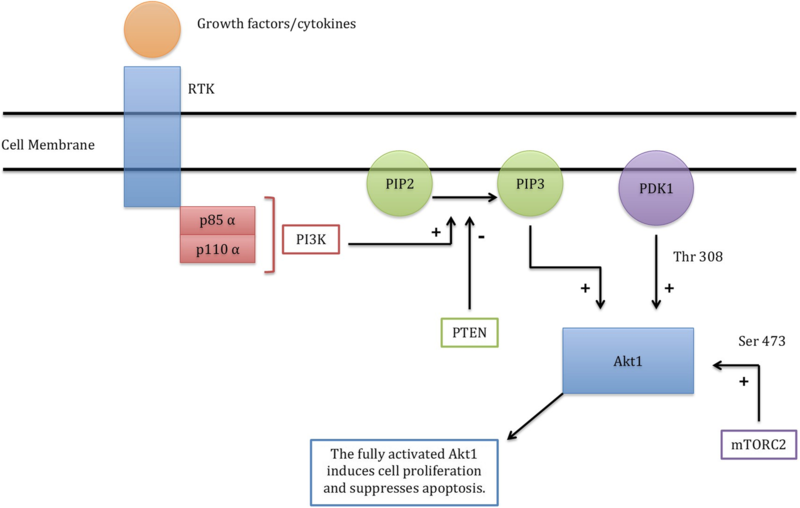 The fully activated Akt1 will then induce cell proliferation and will suppress apoptosis. The pathway is negatively regulated by PTEN which converts PIP3 into PIP2. In conclusion, we describe a unique form of overgrowth syndrome caused by the PIK3CA somatic mutation: p. His1047Arg. We also review similar cases in the literature and offer a wider classification of PIK3CA – related pathology spectrum. Mohammad M. Al-Qattan and Ali Hadadi contributed equally to this work. The authors would like to thank Ms. Zoe P. Camarig for her assistance in editing and proofreading of the manuscript. This work was supported by the College of Medicine Research Center, Deanship of Scientific Research, King Saud University, Riyadh, Saudi Arabia. The datasets used andanalyzedin the current study are available from the corresponding author upon request. MMA and AH have contributed equally and were involved in the study design, organizing the study plan and preparing the manuscript. MMA, AMA and AAE examined the patients, collected the data, and participated in manuscript preparation.MAA was involved in the analysis, laboratory work, manuscript preparation, organizing and supervising the overall work. All authors have read and approved the final manuscript. Collection of sampleswas done following approval by the Institutional Review Board of the National Hospital of Riyadh, Saudi Arabia in compliance the Declaration of Helsinki principles. Parents of our patients signed written informed consents to participate in this study. A written consent for publication of clinical data and images was obtained from the parents of our patients. A copy of the written consent is available for review by the Editor of this journal.